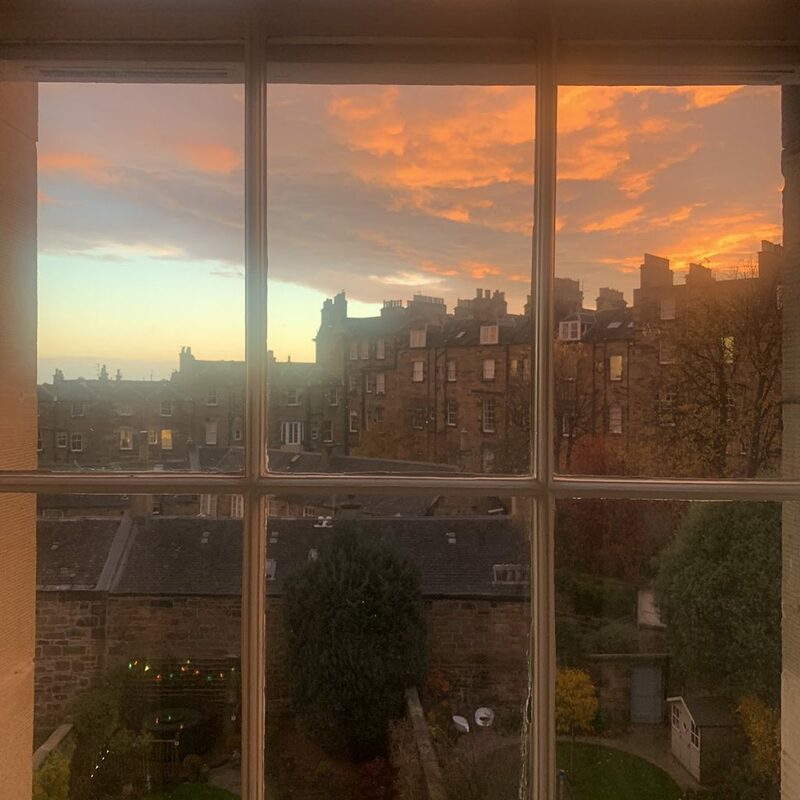 Last November, Rhonda, Tom and Carter traveled to Scotland to visit Jo Barker, Sara Brennan and Lizzie Farey in their studios. 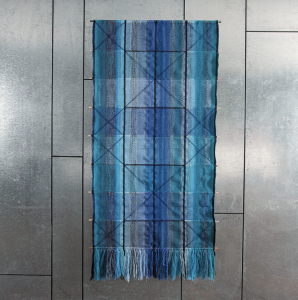 Jo Barker and Sara Brennan have had their weaving studios at the WASPS Patriothall studios in Edinburgh for 30 years. WASPS (Workshop & Artists Studio Provision Scotland) is a charity that provides affordable studios to support artists, arts organizations, and creative businesses. We had a great time framing shots by their large light-filled windows, brick walls, curving stairways. We met another Patriothall artist, Paul Furneaux, while there. His work will be included in our upcoming exhibition Art + Identity: an international exhibition (April 27th – May 5th). 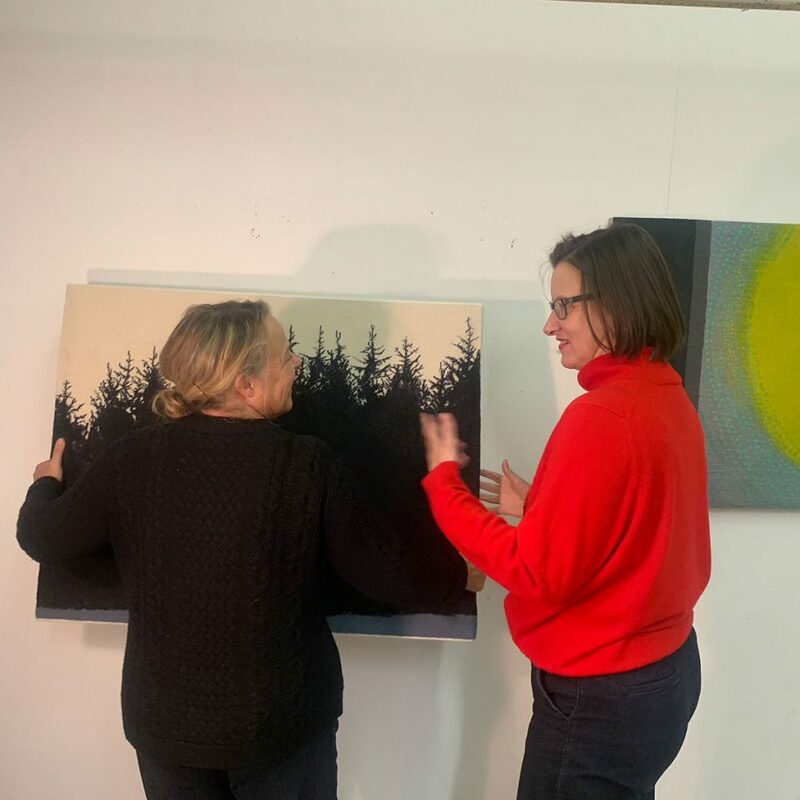 Jo Barker and Sara Brennan will not participate in the April show because they are working full out for their upcoming exhibition at Drum Castle in Aberdeen. A Considered Place is an exhibition of work by Jo Barker, Sara Brennan, Susan Mowatt, Andrea Walsh and Jane Bustin who work in tapestry, ceramics, glass, cloth and paint that will run from April 21st to November 17th. 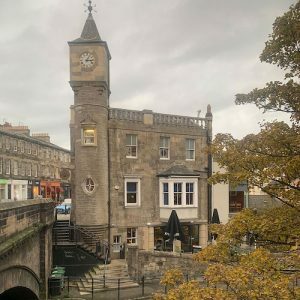 Walking around Stockbridge in Edinburgh was idyllic — George Street and Cow Gate. Restaurants were great and diverse — Scotch Corner, Wee Restaurant, Dishoom and the Blue Parrot Cantina. Our space in the Clarendon Luxury Apartments was spacious and well appointed. 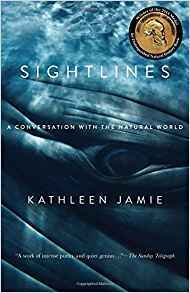 On our last day, we took a picturesque drive to Kirkcudbright, known as the Artists Town, to visit Lizzie Farey, coming back on a bus from Lockerbie. 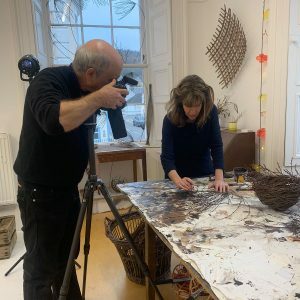 Lizzie works on sculptures of willow, also in an airy WASPS studio with an abundance of natural light in a pretty part of town. We are hoping Farey will be among the artists represented in Art + Identity. A new year and new art, oh my! Marianne Kemp’s Togetherasone was also on social-media display this month. 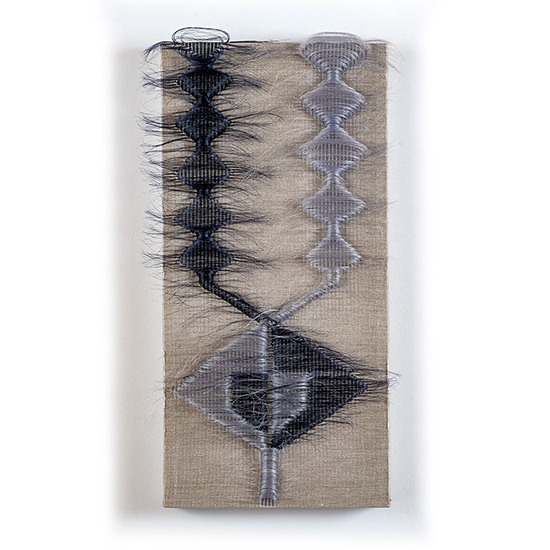 Present in much of Kemp’s work is horsehair, a material which constantly fuels her creativity. 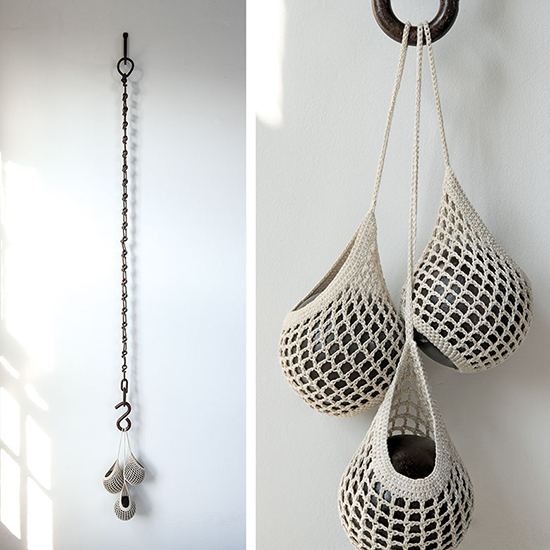 Kemp’s unconventional weaving techniques give each of her pieces a unique character. That uniqueness is further elevated by her unparalleled use of texture, color and movement. The resulting three-dimensional nature of her pieces leaves each viewer not only wanting to look at each piece, but to touch it as well. For Gizella Warburton, last in our social media queue for January, the process of making is visceral. 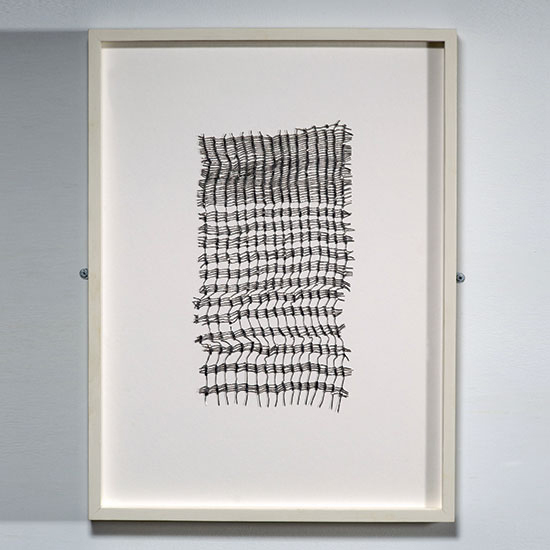 “The materiality of cloth, paper, thread, wood and paint connect me to an innate human urge to make marks” and to “decipher the meaning of our physical and emotional landscapes,” describes Warburton. 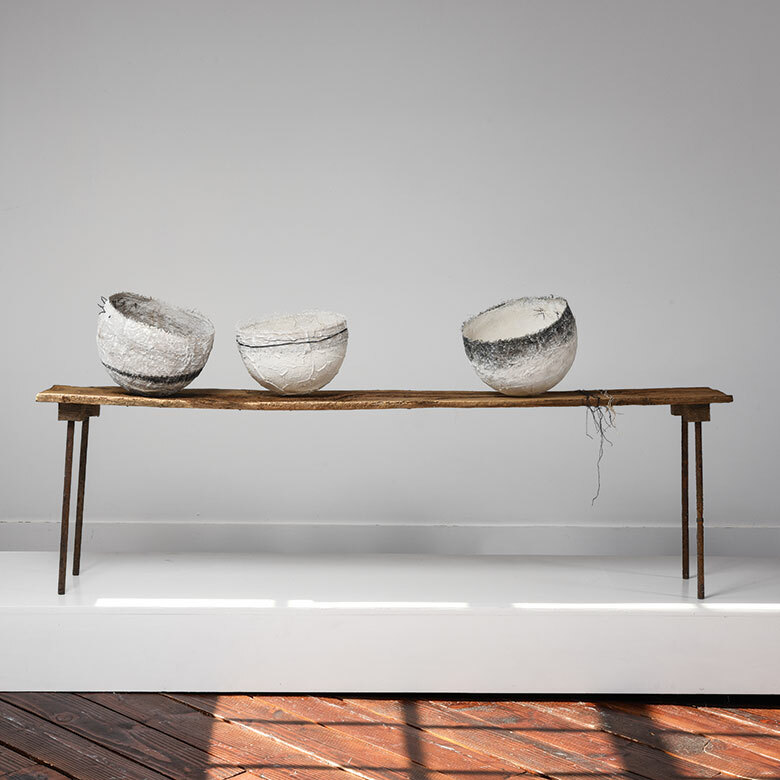 Warburton’s vessel forms, such as Offering i explore an intuitive response to linear, textural and light detail within landscape and surface. 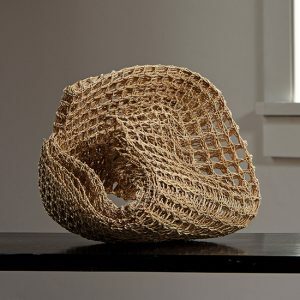 The process of making the vessels forms is quite contemplative, and includes a variety of subprocesses which, in the end, result in and aid each piece in coming to fruition. As we noted in our last two blog posts, Anni Albers has been a profound influence for artists worldwide. 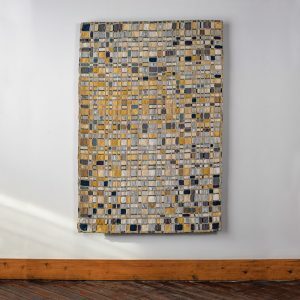 Albers’ ability to combine the ancient craft of hand weaving with the language of modern art, finding within the two a multitude of ways to express modern life, led her to inspire numerous artists, from browngrotta arts, including Sue Lawty who wrote about her Albers’ influence on arttextstyle last week. Neha Puri Dhir, an India-based textile artist, whose captivating geometric-based work will be featured in our upcoming Art in the Barn exhibition, Art + Identity: an international view, has also been influenced by Albers. 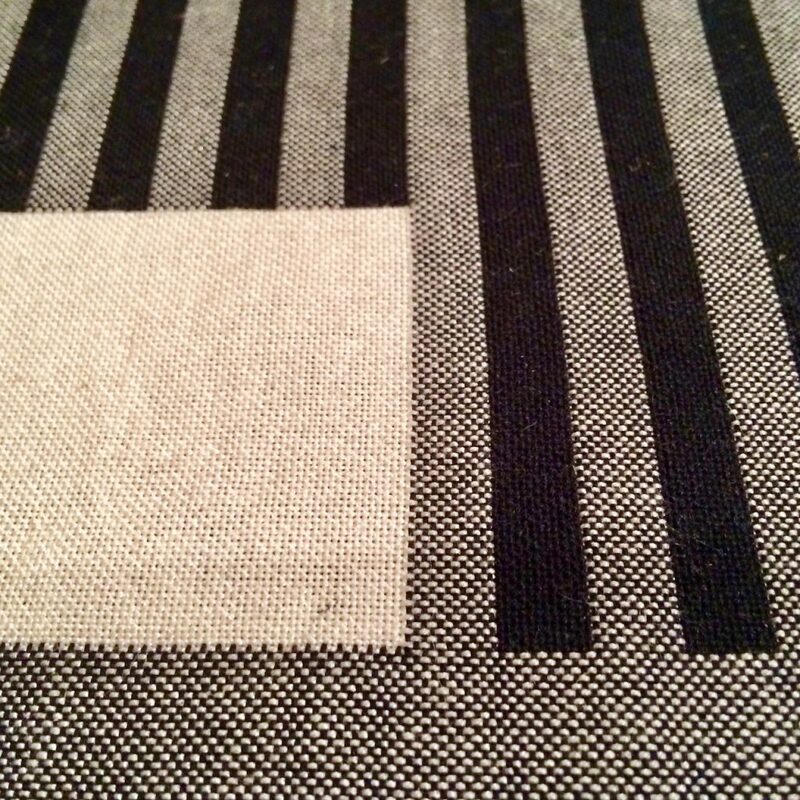 “I have always found Anni’s work as a modernist textile artist revolutionary. Her work has a visual language of simple and direct compositions which has deeply influenced my art practice.” Dhir believes the way in which she expresses interactions of colors and forms as simple compositions in her own work has been unconsciously inspired by Albers. 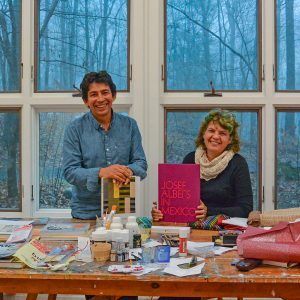 Dhir has embodied Albers’ step-by-step approach to exploration, making that the underlying sensibility of her art practice. I was eleven when On Weaving was first published. I was making dens in the woods and wondering what I’d be when I grew up. 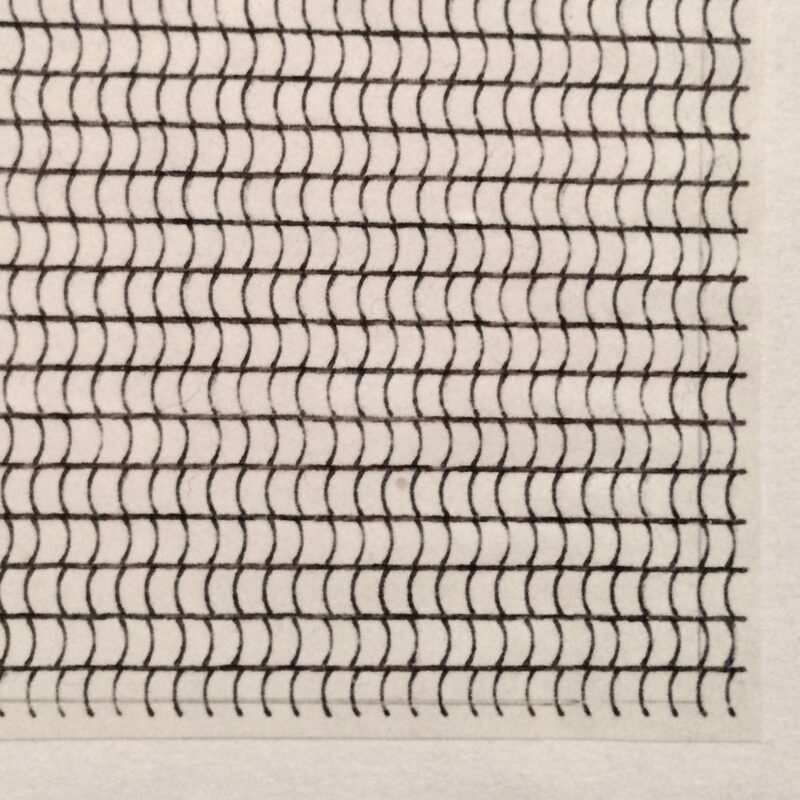 Anni Albers at the Tate Modern. (Lawty’s favorite piece in the exhibition.) Photo by Sue Lawty. 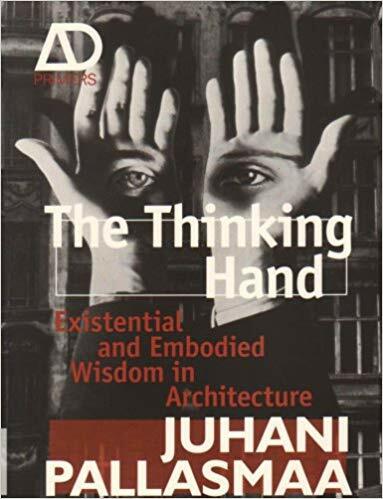 Years later Anni Albers’ seminal book was to become pivotal in the development of my teaching and thinking. I actually bought it in 1983 from the Museum of Fine Arts in Boston, $8.95, black and white, paperback. Yet it wasn’t the images that first grabbed me, but the four pages of chapter eight: Tactile Sensibility. 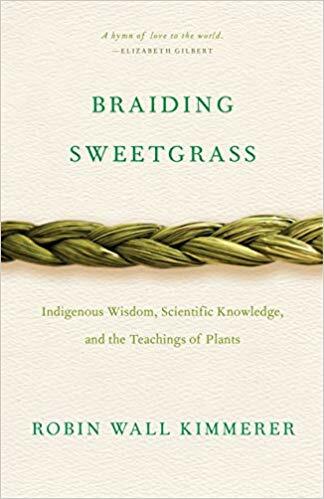 The phrase “tactile sensibility” was new to me, and even if in my fingertips I knew there was such a thing, I’d never heard it named before and given a serious discourse. Of course, many important influences shape us as we carve our creative journey, not least Beyond Craft: The Art Fabric, Mildred Constantine and Jack Lenor Larsen’s groundbreaking publication and the first art book I ever bought. However, it was Anni Albers’ rigorous unpicking of the intrinsic relationship between the structure of weaving and the fibers chosen that fired a key part of my working ethos; as she put it “…the inner structure together with its effects on the outside …the engineering task of building up a fabric …developing the vocabulary of tactile language.” read her words over and over and used them in teaching alongside practical workshops informed by her open, questioning approach. I still do. Visiting the fabulous Anni Albers exhibition at Tate Modern in late 2018, I was struck by how rhythm, repetition, a monochromatic/ limited color palette and the austerity of working with the least number of elements, are all essential elements in both our creative outputs. Legendary artist Anni Albers is getting the long-overdue recognition she deserves in a major retrospective in the United Kingdom. The exhibition, Anni Albers, currently on exhibit at the Tate Modern in London through January 27th, seeks to illuminate Albers’ creative process as well as her engagement with art, architecture and design. One of the most influential textile artists of the 20th century, Anni Albers’ work lead to a reconsideration of fiber and textile as art. Born in Berlin, Annelise Elsa Frieda Fleischmann went to study at the radical Bauhaus art school as a young student in 1922. Fascinated with the visual world at a young age, her parents encouraged her to study drawing and painting. Despite the fact that Albers felt that textiles were considered “toosissy,” she enrolled in the only course open to female students-–weaving in the ‘women’s workshop.’ However, as time passed she developed a passion for the medium, using it as a key form of expression, creating complex and richly colored pliable planes. The exhibition explores how, in the school’s vibrant weaving workshop, traditional hand-weaving was redefined as modern art. In 1933, Anni’s husband Josef was invited to the USA to make visual arts the center of the curriculum at the newly established Black Mountain College in North Carolina. Anni and Josef saw this as an opportunity to escape the Nazi regime and continue exploring their art. During her time in North Carolina, Anni made extraordinary weavings, developed new textiles and taught. Throughout this period, Albers made frequent visits to Central and South America, immersing herself in ancient culture and methods. 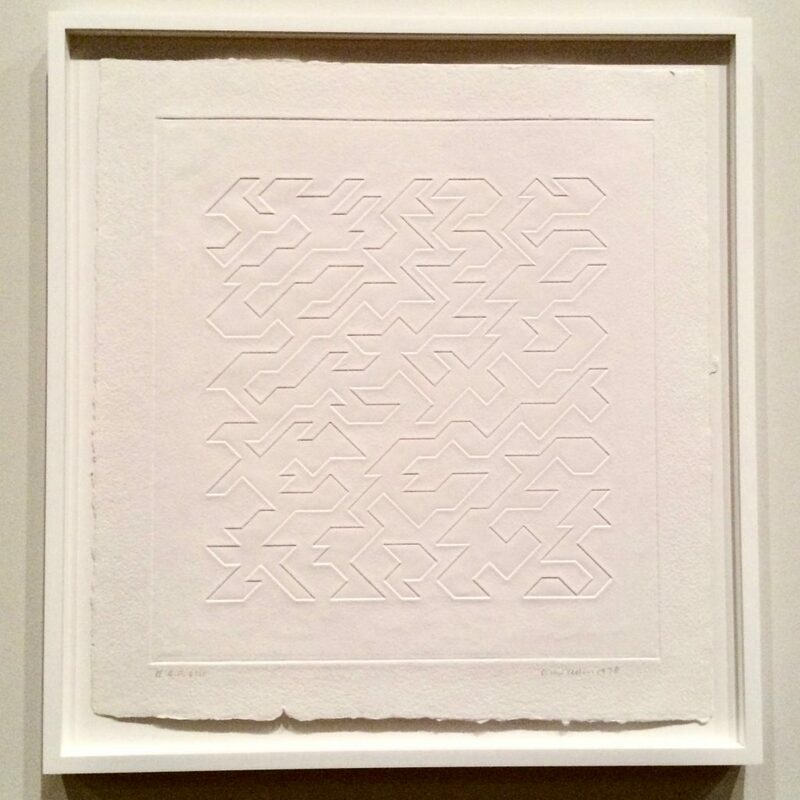 The influence these trips had on Albers’ work is evident in her large-scale pieces, Ancient Writing and With Verticals,both of which can be viewed at the Tate exhibition. In addition to Albers’ pieces, the exhibition includes examples of textiles from around the world that fueled Albers’ thinking and creative processes. Visitors are also invited to view textile works by other artists including Lenore Tawney, Olga de Amaral and Sheila Hicks. 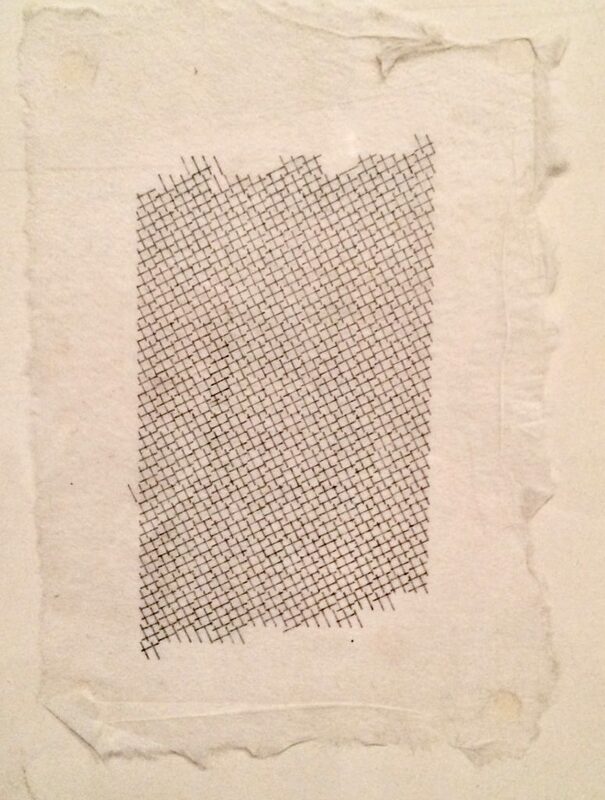 Anni Albers at the Tate. Photo by Sue Lawty. The exhibition at the Tate Modern is the first major retrospective of Albers’ work in the United Kingdom. 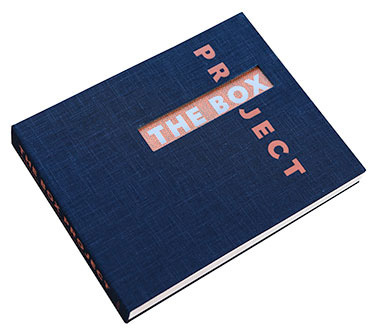 It takes an expansive view, exploring Albers’ creative processes– the intersection between art and craft; hand-weaving and machine production; ancient and modern. The Tate has included over 350 objects of Albers’, including small-scale studies, large wall-hangings, jewelry made from everyday items and textiles designed for mass production. Visitors to the exhibition will be able to “see Albers’ work in close focus, experiencing her belief that textile is inherently many-sided,” writes Corinne Julius in Selvedge Magazine (“Fruit of the Loom,” October 11, 2018). Many of Albers’ weavings are hung freely throughout the exhibition space, allowing visitors to examine them front and back. Though the exhibition has been organized by two major fine art institutions, the Tate and the Kunstsammlung Nordrhein-Westfalen, neither of them own any important works by Anni Albers as her work has been considered ‘craft.’ As a result, the vast majority of objects in the exhibition are on loan from the Josef and Anni Albers Foundation. 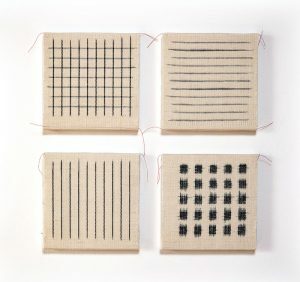 “The whole show is about a woman who is a weaver and how weaving can be a valid modernist art practice. Anni Albers’ work is not ‘decorative,’ wires Julius. 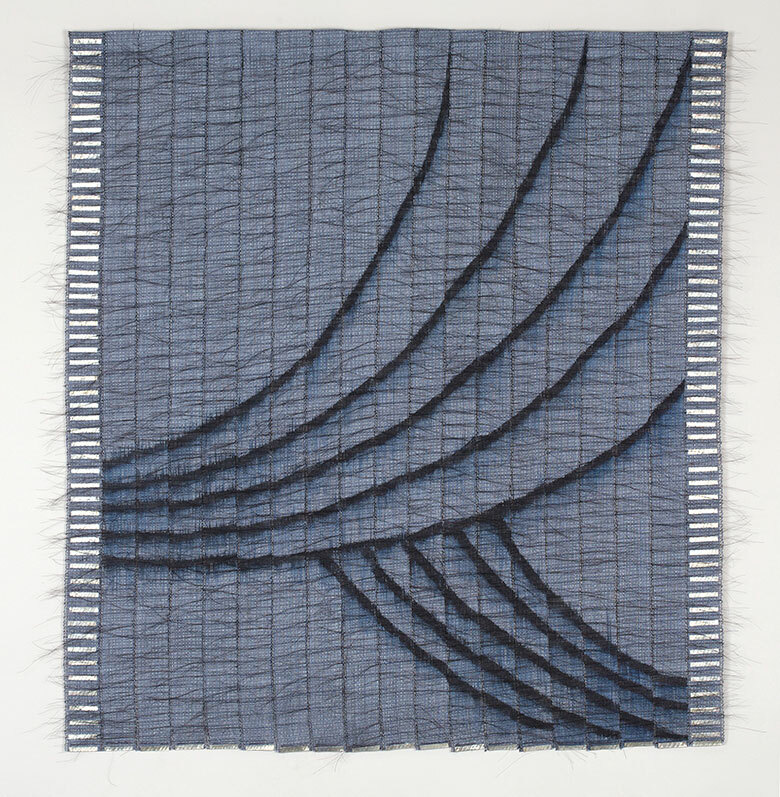 “It’s quite conceptual – corroborating Roland Barthes’ comment that the loom is ‘a maquette of reasoning,’” Ideally, Anni Albers will move the boundary of what is and is not considered fine art. For more information on the exhibition, which closes on January 27th, visit the Tate’s website HERE. It’s hard to believe another year had passed, but we are welcoming 2019 with open arms here at browngrotta arts. We are excited for all the great things to come in 2019, but we’ll shed a light on all the great art we shared on our social media throughout the month of December. From Laura Ellen Bacon’s Attached to Adela Akers Night Curtain there was quite a diverse line up on display in December. Next in the queue was Endless by Rachel Max. Made of plaited and twined cane, Endless’ unique form piques’ the viewers’ curiosity. 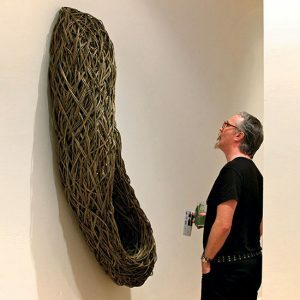 Through sculptural basketry, Max investigates the relationship between lace and basket making techniques. Often inspired by natural shapes, Max enjoys exploring the concepts of containment and concealment in her work. With this exploration, Max has developed a technique of layering to form structures that probe into the relationship between lines, shadows and space. The origins of Stéphanie Jacques‘ Ce qu’il en reste VI is rooted in her adolescent years with scoliosis. Jacques spent many years wearing corrective corsets, which inhibited her from many activities, such as dance. 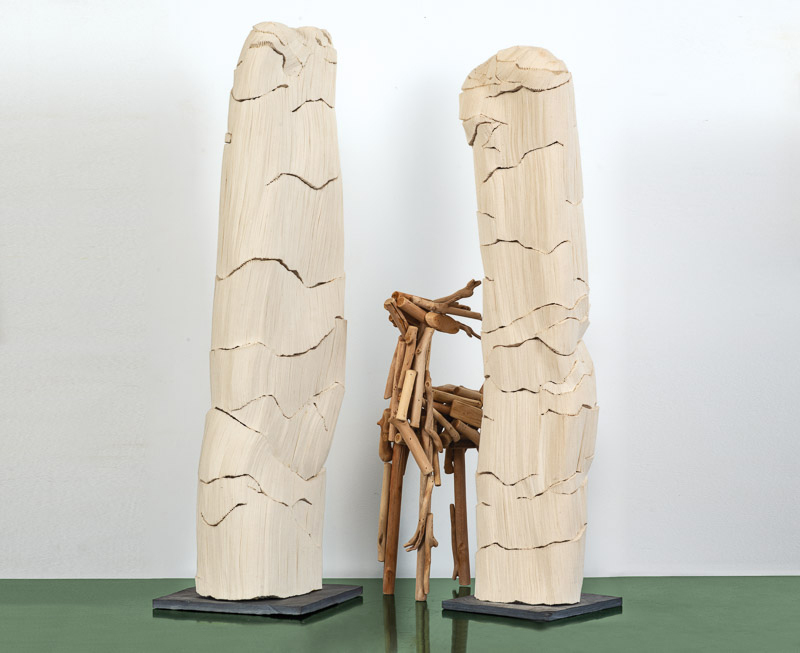 This series of sculptures, known as the Miss Metonymy sculptures are built as vertebral columns. 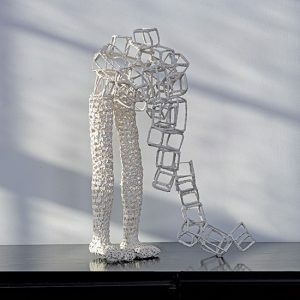 Jacques has spent many years trying to create a figure that stands up, however, leaving the idea of verticality allowed that to become possible. To conclude 2018’s New This Week posts we shared Night Curtain by Adela Akers. Unique to Akers’ work is her utilization of horsehair and recycled metal foil strips from the tops of wine bottles. Incorporating metal into her work adds another dimension, one that becomes a veil through which metal can shine through. In Night Curtain the luster of metal and veil of horsehair is reminiscent of stars peeping through a thin curtain of clouds in the night sky. Wishing You the Magic of the Season and an Artful New Year! 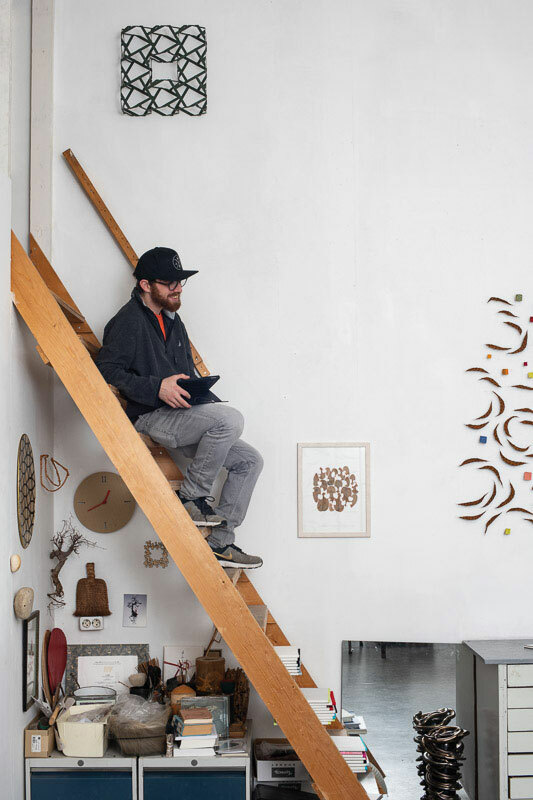 Carter on the stairs in Marian Bijlenga’s studio in Amsterdam. 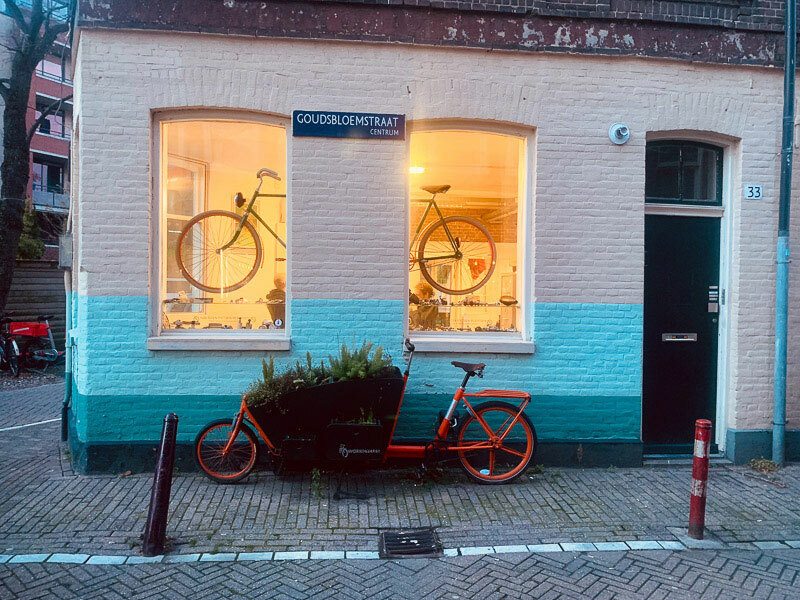 In November, Tom, Carter and Rhonda traveled too Brussels, Amsterdam and Utrecht to catch up Stéphanie Jacques, Marian Bijlenga and Marianne Kemp in their respective studios. Each studio was housed in an unusual re-envisioned space, one a former hospital another a primary school, their studios contained glimpses of past work and future projects. As in the UK, all three artists were extremely generous with their time and thoughts. We came away with more material for the series of books we hope to do one day. In the meantime, enjoy a quick view of this leg of our extraordinary trip. Stephanie Jacques is a good sport while Tom and Carter prep the shot in her Brussels. Every vantage point in Amsterdam is a photo opp. Another shot in Marian Biljenga’s studio. 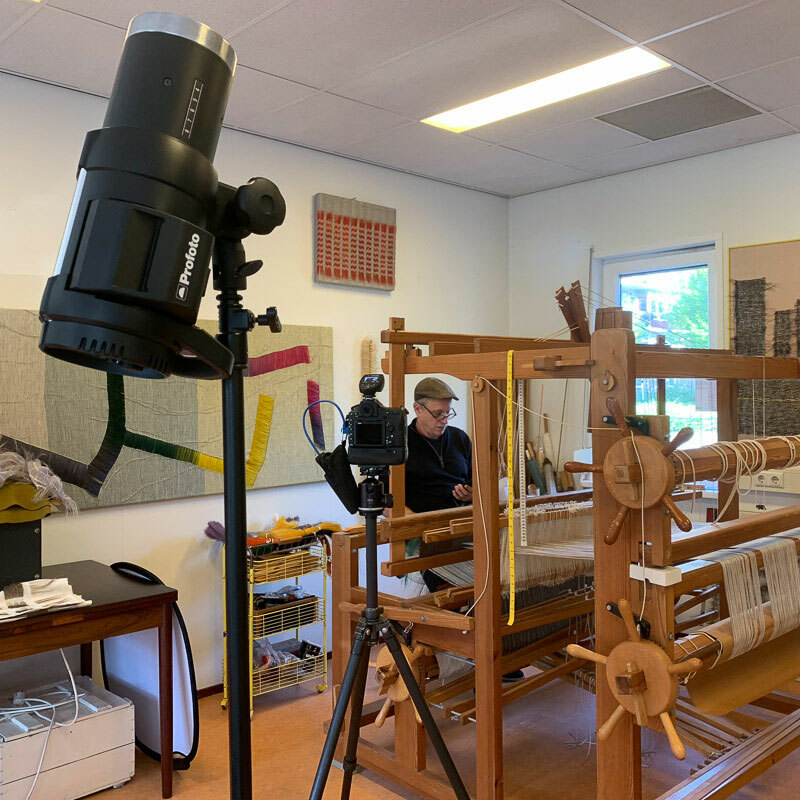 Tom tests the light on Marianne Kemp’s loom in Utrecht. 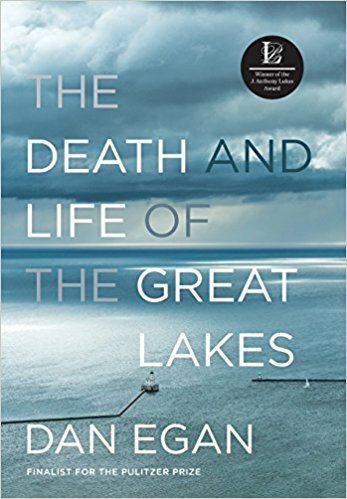 We received many good suggestions for this year’s book round up and have added two of our own. 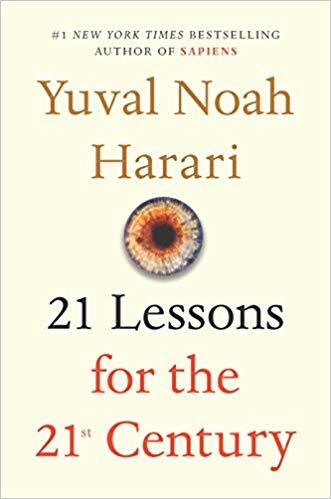 “For me,” writes Heidrun Schimmel, “one of the most inspiring books was 21 Lessons for the 21st Century by Harari Yuval Noah (Spiegel & Grau 2018).”It’s not an art book, “but one nevertheless very important for my work.” In it, the author conducts an important conversation about how to take on the problems of the 21st century. 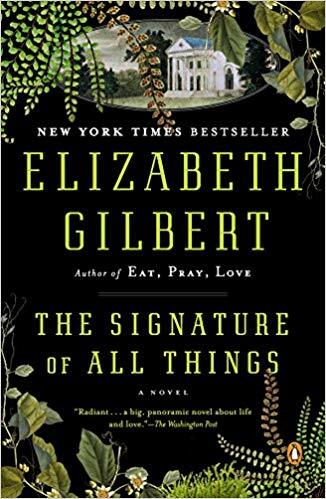 Chris Drury also recommends a non-art book, a novel by Elizabeth Gilbert, A Signature of All Things (Riverhead Books, 2014). 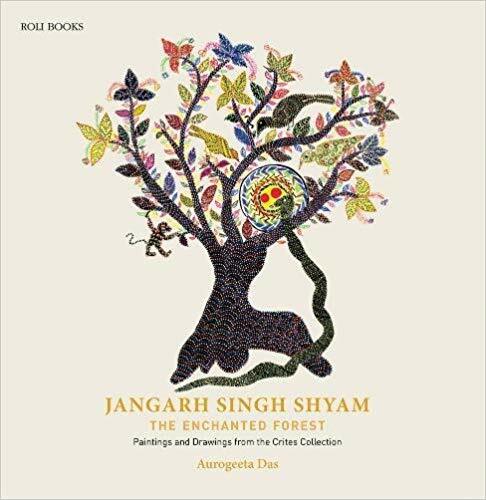 /2017/10/jangarh-singh-shyam-enchanted-forest.html.Singh was a member of an indigenous tribe from Madhya Pradesh in India who created murals, acrylics on paper, clay reliefs and and screen prints of tribal deities that had not been previously visualized and flora and fauna remembered from his childhood. We have two picks this year. 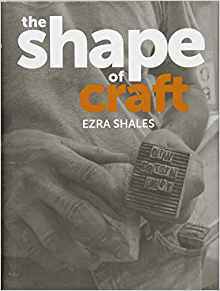 First, The Shape of Craft by Ezra Shales (Reaktion Books, 2018), a book we predict will join the list of those that readers return to again and again. 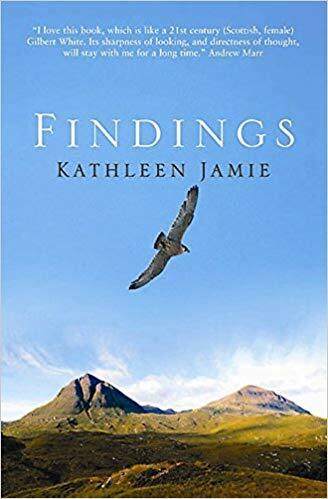 It explores some of the key questions about craft: who makes it, what we mean when we think about a craft object and how that shapes our understanding of what craft is. Shales’s discussion ranges widely across people and objects: from potter Karen Karnes to weaver Jack Lenor Larsen, glass sculptor Dale Chihuly to Native American basket-maker Julia Parker, as well as younger makers such as Sopheap Pich and Maarten Baas, and to the porcelain and cast-iron sanitary ware produced by the Kohler Company, the pottery made in Stoke on Trent and the people in Asia today who weave beautiful things for IKEA.”This book is of particular value to the fine arts, where today’s practitioners are reaching out more and more into traditional craft without understanding its context,” writes Garth Clark in CFile. 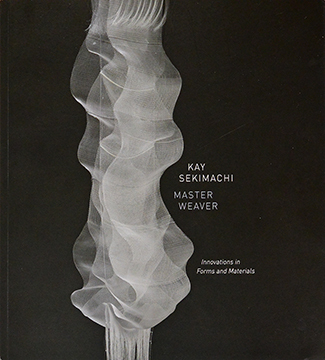 “The Shape of Craft lets them know that while rooted in labor, material and haptic experience (I only acknowledge craft as a verb) it can also be intellectually profound and conceptually textured.” The second, and latest, catalog of Kay Sekimachi’s work, Kay Sekimachi: Master Weaver (Fresno Art Museum, 2018) prepared to accompany this year’s one-person exhibition at the Fresno Museum of Art. Kay Sekimachi: Master Weaver is lushly illustrated with never-before-seen works from the 1940s to works through the 60s, 70s, 80s, up to 2017. The curators, Kristina Hornback and Michele Ellis Pracy, aimed “to select and ultimately present artwork that encapsulates the breadth, variety, and intrinsic voice of an artist,” in order to illuminate her 77 years “of experimental and remarkable art making.” They have succeeded, masterfully. 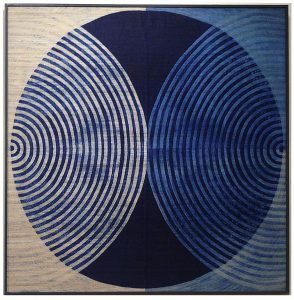 Markings and Blues, Adela Akers, linen, horsehair, metal and paint, 28” X 30”, 2018. Photo by Tom Grotta. Fall is coming to a close and the winter months are approaching here at browngrotta arts. 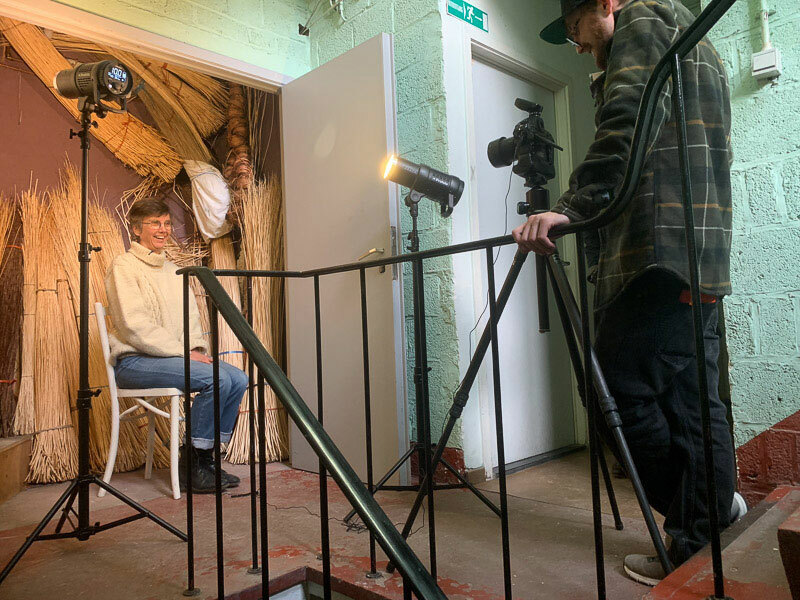 During the end of October and throughout the beginning of November, Tom and Carter and sometimes Rhonda, traveled around the UK and Europe capturing artists at work in their studios. Though these ventures were grand they didn’t deter us from sharing our New This Week posts. Stay tuned for more blog posts on Tom’s, Rhonda’s and Carter’s photo adventure in the coming months, but for now take a minute and read more about the art we shared this month on our social media. We commenced November with Adela Akers’ eye-catching Markings and Blues. 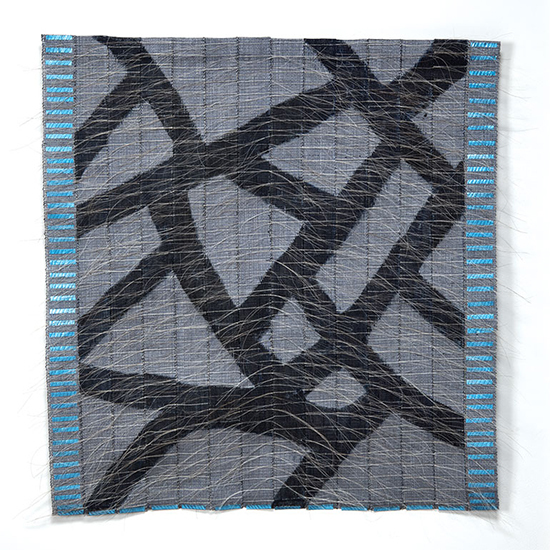 As in her other pieces, Akers has incorporated horsehair into Markings and Blues. 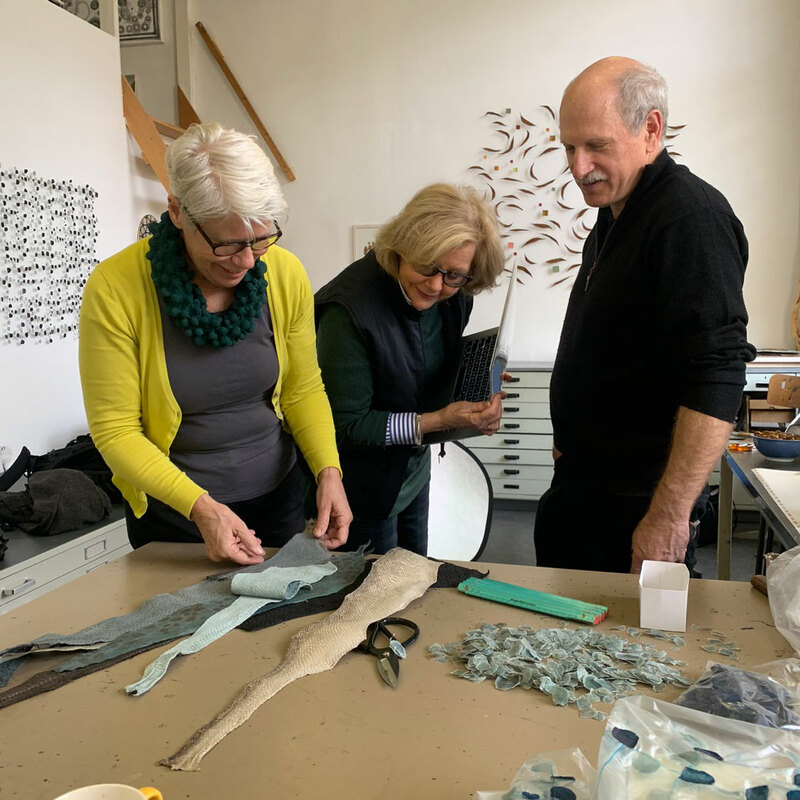 Employing stiff horsehair in her work helps Akers add both texture and dimensionality, two characteristics which create a richer surface and draw focus to her work. 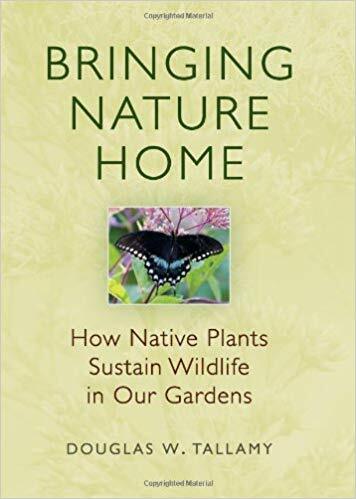 In recent years, Akers has drawn inspiration from her life journeys. These journeys have had a transformative effect, increasing her self-confidence, expanding her artistic vision and helping her to create pieces such as Markings and Blues. Kaze, Yasuhisa Kohyama, ceramic, 14.75” x 11.5” x 4.75”, 2017. Photo by Tom Grotta. Next up, Kaze by Japanese ceramic artist Yasuhisa Kohyama. 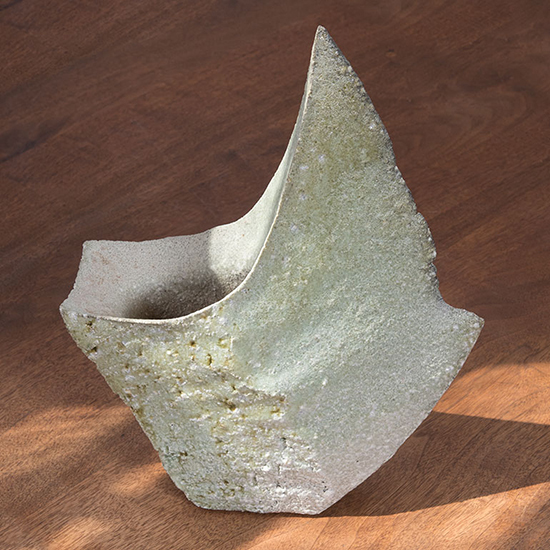 Like Kohyama’s other ceramic pieces, Kaze was made with using an anagama kiln, a traditional Japanese wood-firing kiln. Kohyama revitalized the use of the anagama kiln and has become a Sueki master. Though the ceramic is left unglazed with the Sueki method, the resulting surface appears glossy. The piece’s form is perfectly reflected in its name—Kaze; a word that represents things that enjoy the freedom of movement. 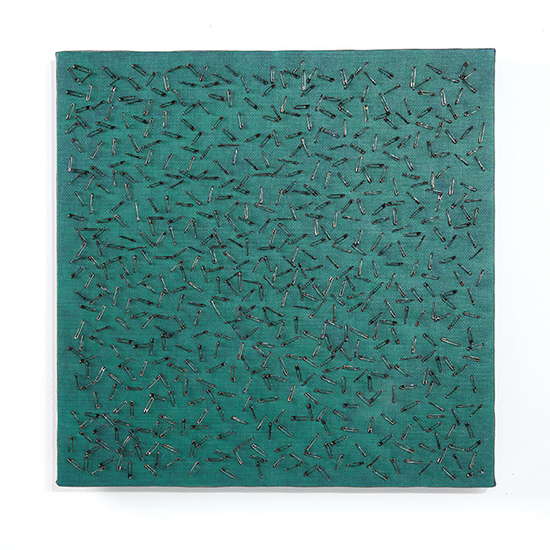 Green Blue Screen One, Tamiko Kawata, cardboard, safety pins, acrylic on canvas, 20” x 20”, 2018. Photo by Tom Grotta. The stark contrast between the bright background and glistening safety pins of Tamiko Kawata’s Green Blue Screen One also caught our eye in November. Safety pins hold a multifunctional purpose for Kawata. Upon her move to New York in the 1960s, Kawata utilized safety pins for their unassuming, everyday purpose: to pin up clothing that was too large for her small frame. However, over time Kawata developed a fascination for the medium. 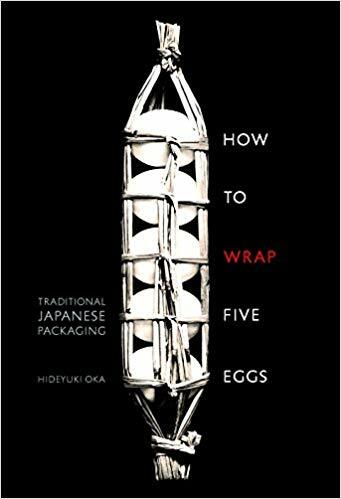 The pins have facilitated Kawata in her exploration and construction of drawing-like works, self-standing, three-dimensional forms and jewelry. The physical practice of creating complex pieces with simple utilitarian objects provides a meditative and reflective process for Kawata. 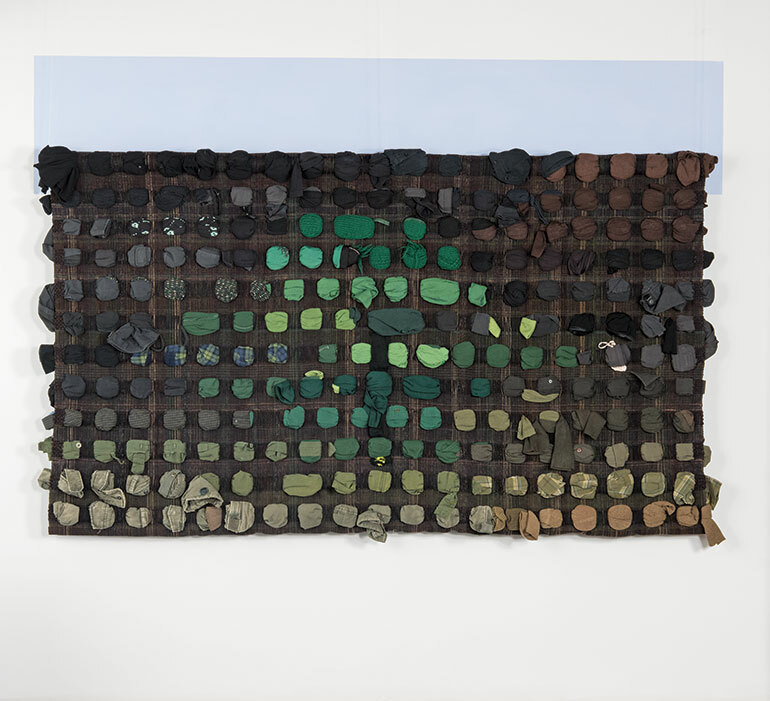 Hunting (Jagtmark), Ane Henriksen, Scottish wool, weft: worn out clothes, 65” x 92”, 2017. Photo by Tom Grotta. We concluded the month of November with Hunting (Jagtmark) by Ane Henriksen. The piece, which spans over 7.5 feet, was woven using Scottish wool and weft: old worn-out hunting clothes. Henriksen’s inspiration for Hunting derived from a painting by the Danish artist Jens Soendergaard. “I saw so much lust and longing in his green landscape,” explains Henriksen. As mentioned, Hunting is made of worn-out hunting clothes, some of which are undergarments, illustrating the different ways and fields in which hunting takes place.